Ferdinand and Nina are starring in a new story! Actually, it's an old story, but newly written in picture book form. 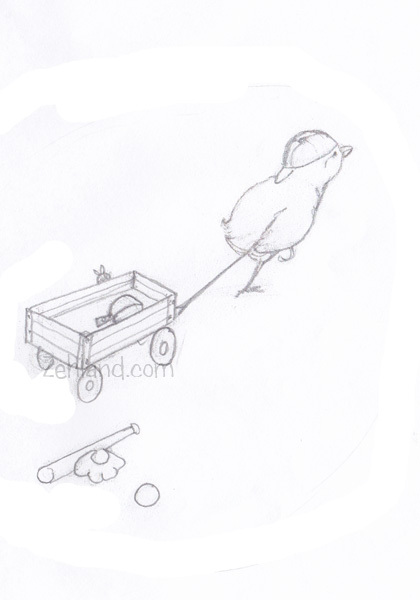 In this story, Mother Hen sends Ferdinand to the market to buy fruit for dinner. She should not have done that - we never know what Ferdinand will do. The text for the book is completely written - yay! (though it's subject to change as I illustrate it). There are some things I like about this sketch. It shows strong forward motion to carry the reader to the next page. Ferdinand has left his ball and bat behind and looks like a chick on a mission! 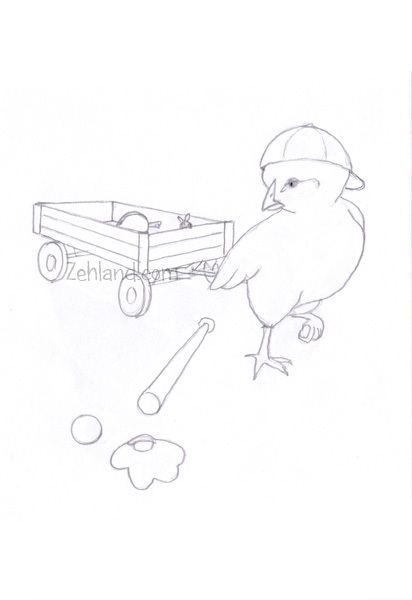 But I had to use words to convey that he was reluctant to give up his baseball practice to obey Mother. And I prefer to let the picture tell the story instead. There is some reluctance evident because he's looking back even as he moves forward. He is still going in the direction of the next page. He does not look determined just yet. But that's OK, the determination can develop as the story develops. I like them both actually, so input is welcome! Which do you like better? Let me know either below or on the Zehland Facebook page.